One-in-six newlyweds (17%) were married to someone of a different race or ethnicity in 2015, according to a new Pew Research Center analysis of U.S. Census Bureau data. This represents a more than fivefold increase from 3% in 1967, the year in which the Supreme Court ruled in the Loving v. Virginia decision that interracial marriages were legal. While intermarriage is generally more common in metropolitan areas than in more rural non-metro areas (18% of newlyweds vs. 11%), there is tremendous variation within metro areas in the shares of newlyweds who have a spouse of a different race or ethnicity. Interactive: Which U.S. metro areas have the largest and smallest shares of intermarried newlyweds? These areas are all relatively diverse in terms of race and ethnicity, and this diversity likely contributes to the high intermarriage rates by creating a diverse pool of potential spouses. In Honolulu, for instance, the “marriage market” (which is defined as all unmarried and recently married adults, and serves as a proxy for the recent pool of potential partners in the area) is made up of 42% Asians, 20% non-Hispanic whites and 9% Hispanics. In the Las Vegas area, 46% of people in the marriage market are non-Hispanic white, while 27% are Hispanic, 14% are non-Hispanic black and 9% are Asian; and around Santa Barbara, 52% of people in the marriage market are non-Hispanic white and 37% are Hispanic. 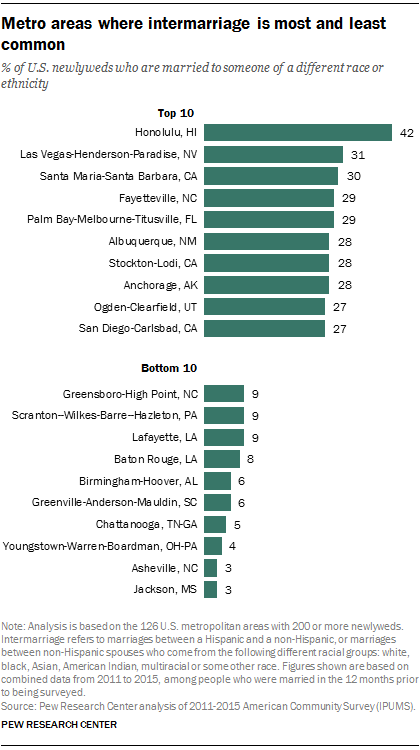 Fayetteville, North Carolina, and the area around Palm Bay-Melbourne-Titusville, Florida, have high intermarriage rates as well. These areas are characterized by less diversity than their Western counterparts. However, the fact that both are located near military bases likely contributes to the high rates of intermarriage, since intermarriage is typically more common among people in the military than among civilians. At the other end of the spectrum, about 3% of newlyweds in Jackson, Mississippi, and Asheville, North Carolina, are married to someone of a different race or ethnicity. The same is true of 5% of newlyweds around Chattanooga, Tennessee, and 6% of those around Greenville, South Carolina, and Birmingham, Alabama. Intermarriage is relatively uncommon in the Youngstown, Ohio, area as well. Some of these metro areas include marriage markets with relatively little racial and ethnic diversity, which likely contributes to the relatively low rates of intermarriage. In Asheville, for instance, 85% of the pool of potential spouses is white, and in Youngstown, 79% of the marriage market is comprised of whites and another 15% is comprised of blacks. However, the same does not hold true in Jackson or Birmingham. The marriage markets around those cities are fairly diverse: In Jackson, the pool of potential spouses is comprised of 61% non-Hispanic blacks and 36% non-Hispanic whites; in Birmingham, the marriage market is comprised of 57% non-Hispanic whites and 37% non-Hispanic blacks. One factor that contributes to the low intermarriage rates in these areas may be the lower acceptance of interracial marriage. Some 13% of adults in the South say that more interracial marriage is a bad thing for society, and 11% of those living in the Midwest, where Youngstown is located, say the same. By comparison, smaller shares in the West (4%) and the Northeast (5%) say that more interracial marriage is a bad thing for society. Note: Click here for full interactive table of 126 U.S. metro areas sortable by race and ethnicity.